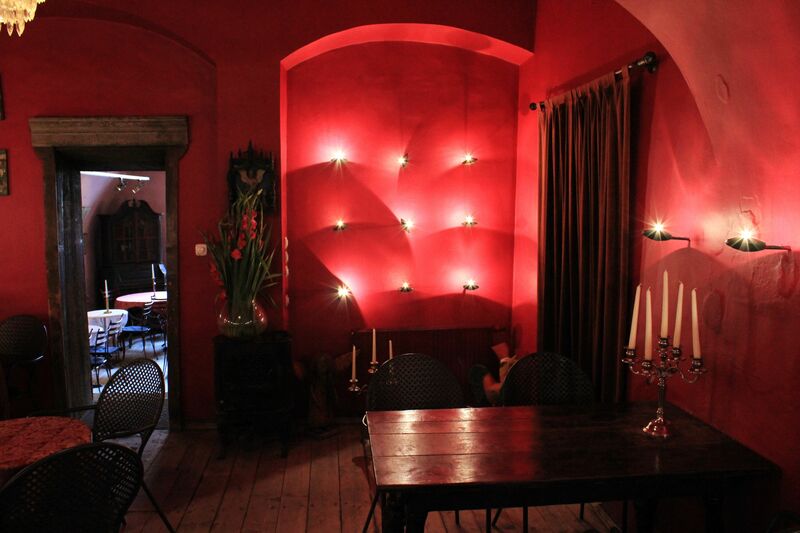 Café Camelot, located in the corner of the Unfaithful Thomas Lane (Zaulek Niewiernego Tomasza) is one of the most fashionable coffee bars in Cracow. 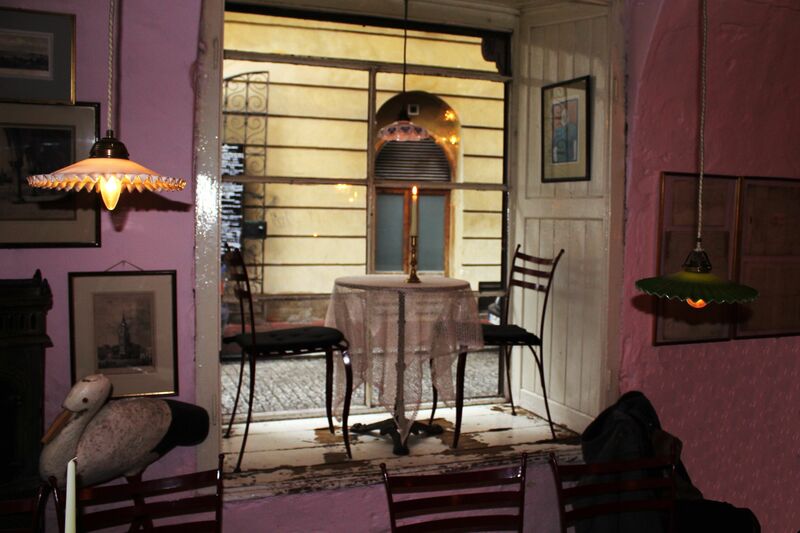 It shares the admiration of Cracowians and tourists with two similar “gems” nestled in this corner – restaurant-café-bar Cherubino and café-bar Dym (Smoke). Frankly there is something special in this part of the St. Thomas Street, something that has an instant appeal. May be the fact that that this is one of only few crooked streets in the whole Krakow's Old Town or may be its doubtful past? In last two hundred years the location housed iron-worker shop, blacksmith shop, brothel, then made it to the movie business as a setting for the film later converted to an art gallery…. Quite a story and this is without even mentioning largely unknown but certainly “colorful” past from its deep Middle-Ages origins. Probably that is where from the Unfaithful Thomas Lane and its flag-ship café-bar Camelot inherited this special atmosphere charged with bohemian spirit and vibes from sometimes morally dubious “artistic” past. The deteriorated frontal façade probably intentionally gives to the Café Camelot a “well-maintained” picture of an establishment with a long history. Whatever is the reason, this apparent form of disarray and negligence serves as a first signal of something unusual in the heart of Cracow’s Old Town. It “softens” the contrast with what unravels in front of you when stepping inside of the 14th century walls. 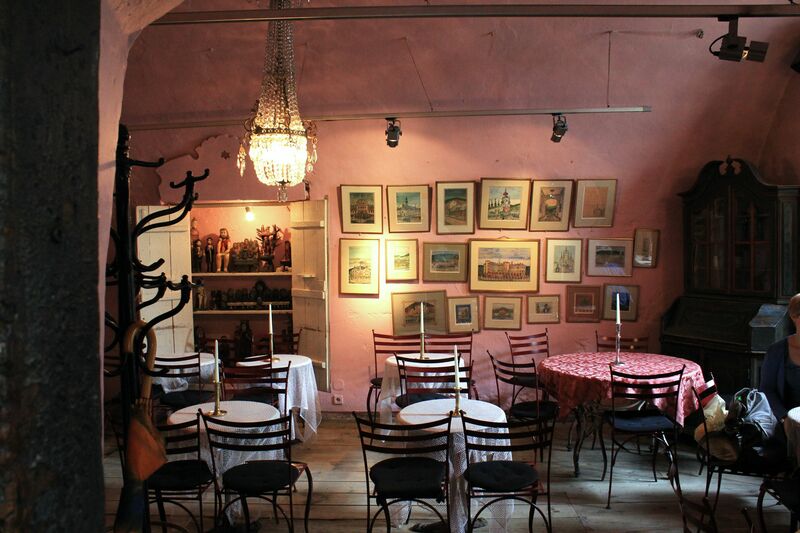 Uneven surfaces in pink or dark reddish colors, little rickety tables with beautiful chairs visibly touched by the hand of time, old wooden wardrobe and bookshelves loaded with all kind of “junk” , leave no doubt that you entered a different world. 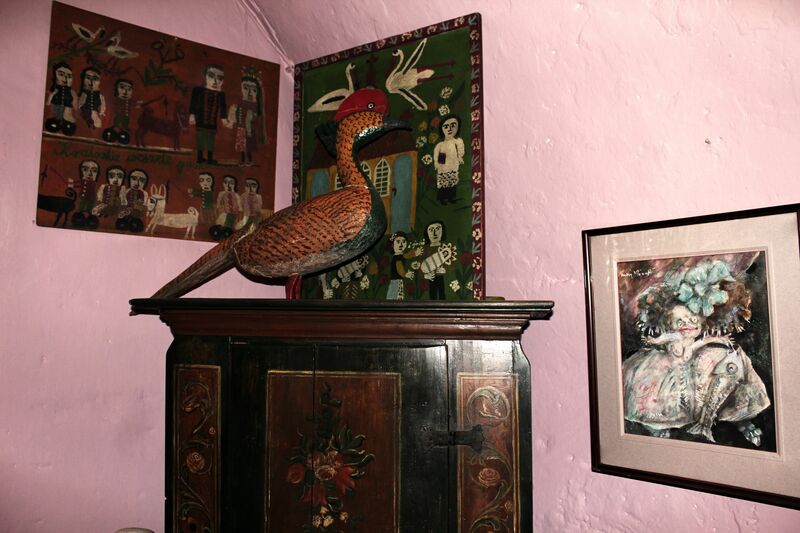 Paintings representing an original “naïve” art of self-thought countryside artists, hand-carved wooden dolls, series of folk sculptures, wooden birds, old photos pinned to walls create a unique, may be a bit kitschy yet charming “Fin de siècle” ambiance. 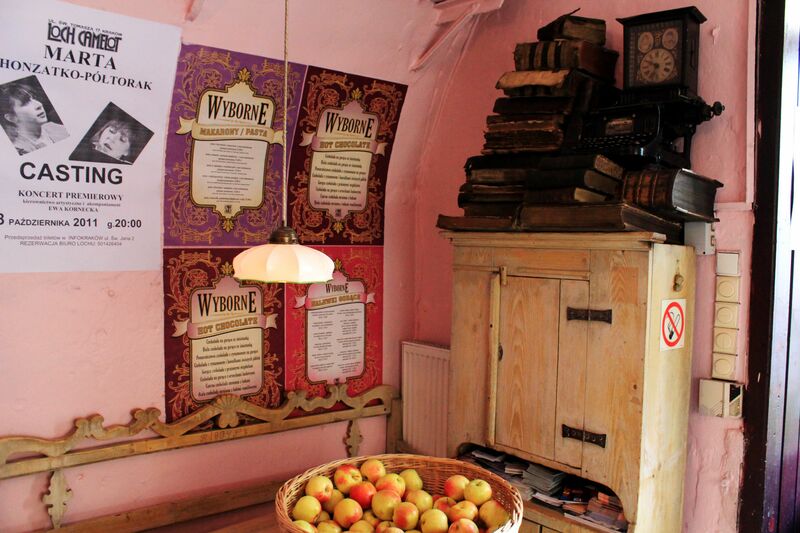 It’s tight, but very intimate and friendly, it’s shabby but undeniably magic… So much to see, feel and chew over….. Sound of squeaking floorboards gently mixes with music … Frequent visitors say - this is the place to be! Artists proclaim it a “Sacred Place”! Café Camelot: What's in the Kitchen? The menu generously covers breakfast items (sandwiches, eggs, French croissants, choice of sliced ham & meat, selection of cheese, panini, baguette with mozzarella, tomato & basil.…. ). Interestingly the breakfast menu is available all day long (good news for late-risers and night owls). 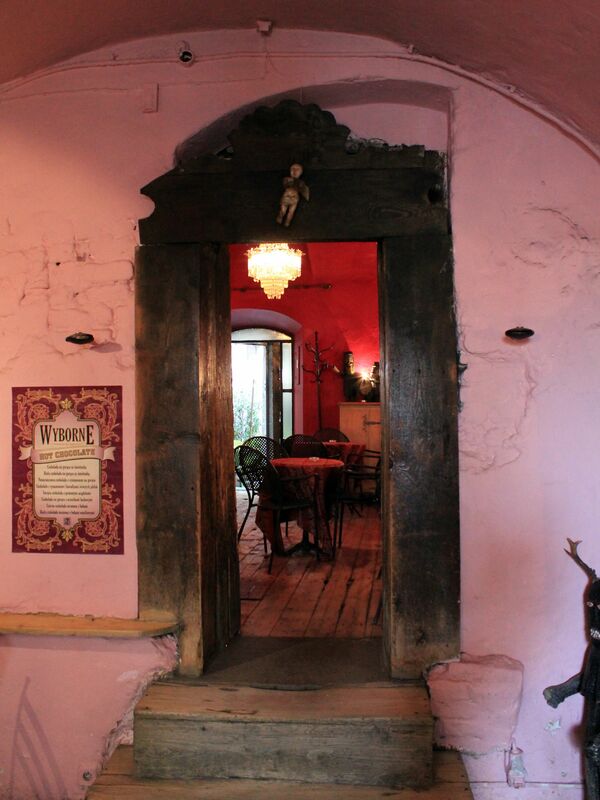 You will also find some “light” lunch options like typical Polish soups, “pierogi” (dumplings), pastas and salads. 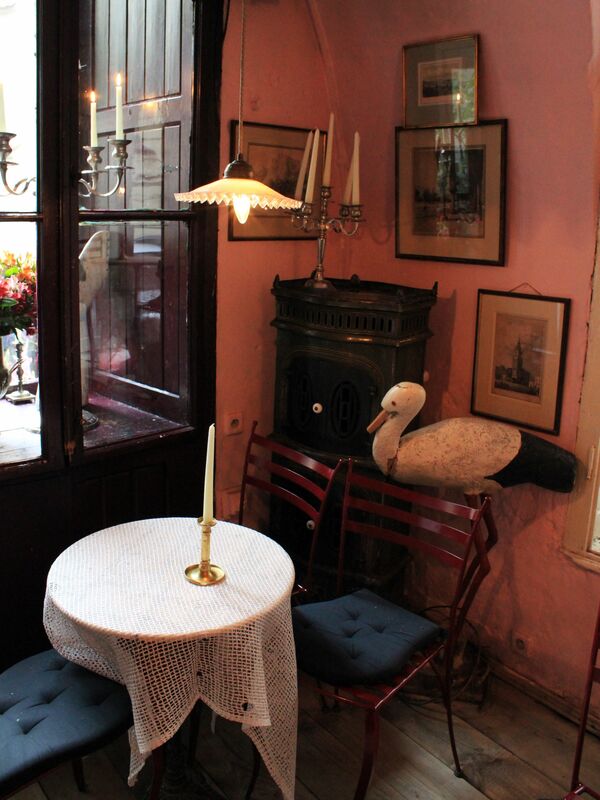 Café Camelot: Charming interior with its “Fin de siècle” ambiance. But frankly, the Café Camelot is not the place for food-devouring feast. 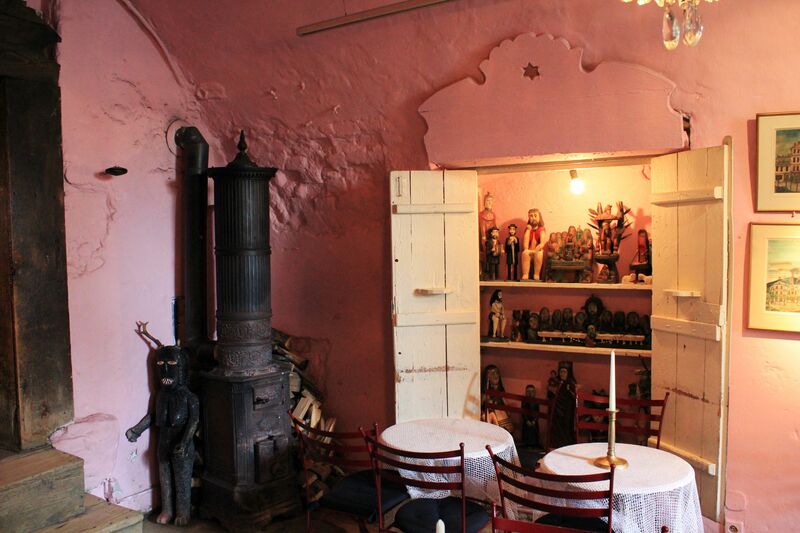 It is a spot for “spiritual-like rituals” – sipping latte with an “out of this world” szarlotka (apple pie), enjoying tea with raspberry juice (winter time it’s a nice alternative to vodka to get warmer! ), or an espresso usually served with a small slice of fresh watermelon and cherry. 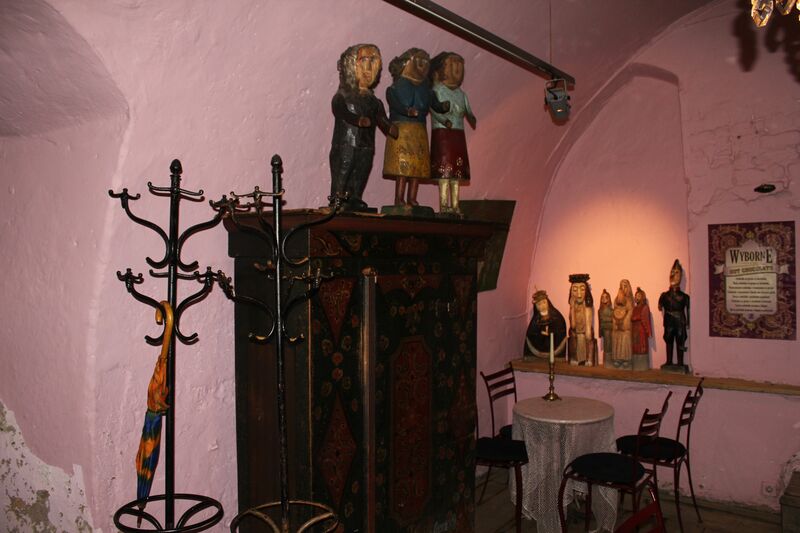 It is a place for having one of local alcoholic drinks – be it a beer, mead, wine, tincture (try the rose-flavored one) or mulled wine (red wine combined with spices and served warm). 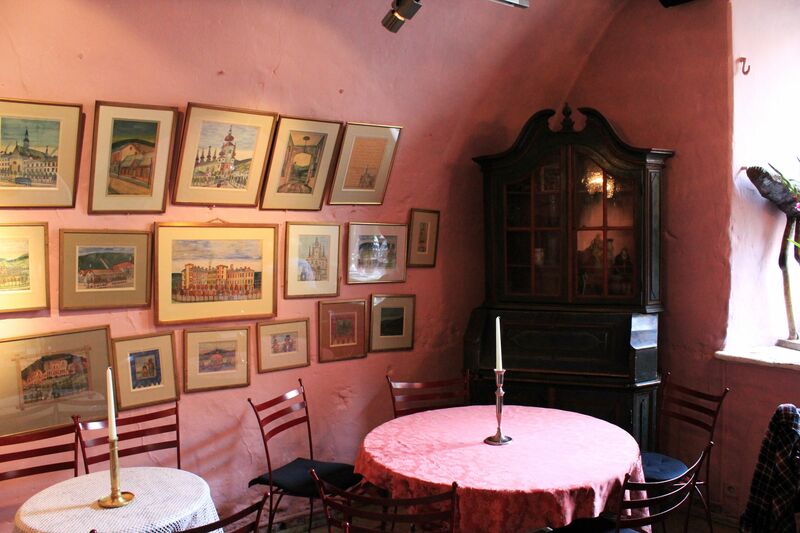 It is a place to treat yourself with one of Café’s own home-made sweets (apart of szarlotka, you may also try a “raspberry” cheesecake), baked apple, ice creams, hot chocolate…. 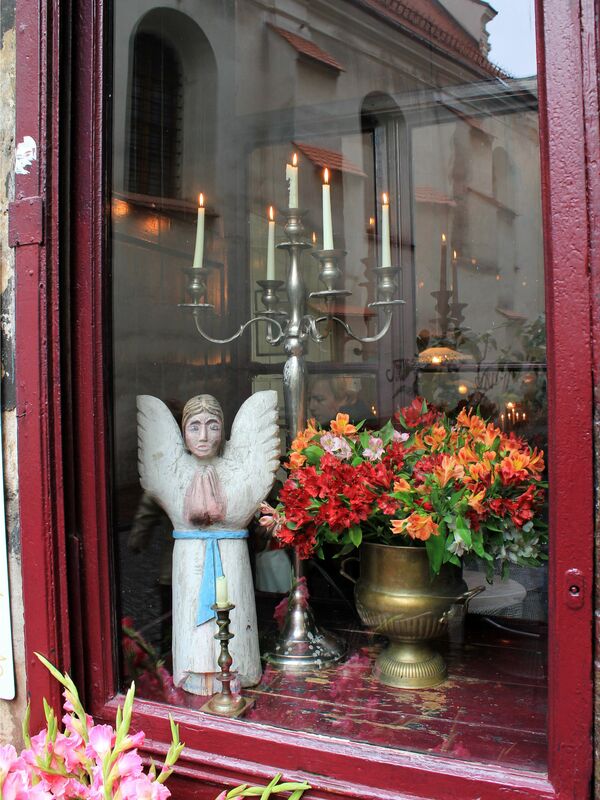 The small table perched in the recessed window is a fabulous place for two… It is a dream place for a romantic “tête-à-tête” with your loved one. Just imagine a late evening winter time, a glimmering candlelight softens shapes of everything around, warmness spreads from the wood burning stove in the corner…. and behind the window the best of the winter in town - a joyful dance of falling snowflakes. Who will resist the charm of such place? Few minutes of video are better than thousands words, so please enjoy Camelot's "Window Seats" by selecting: What's cooking in Krakow? Café Camelot: Deep red, almost "infernal" cafe's no-smoking section..
Café-Camelot consists of three rooms, the white-pinkish one for smokers (always full) and on the opposite side of the premises the red one for no-smokers (somehow not that busy). There are also two summer gardens. One, located on the Unfaithful Thomas Lane and shared with the restaurant Cherubino allows you to keep in touch with the noisy city life. 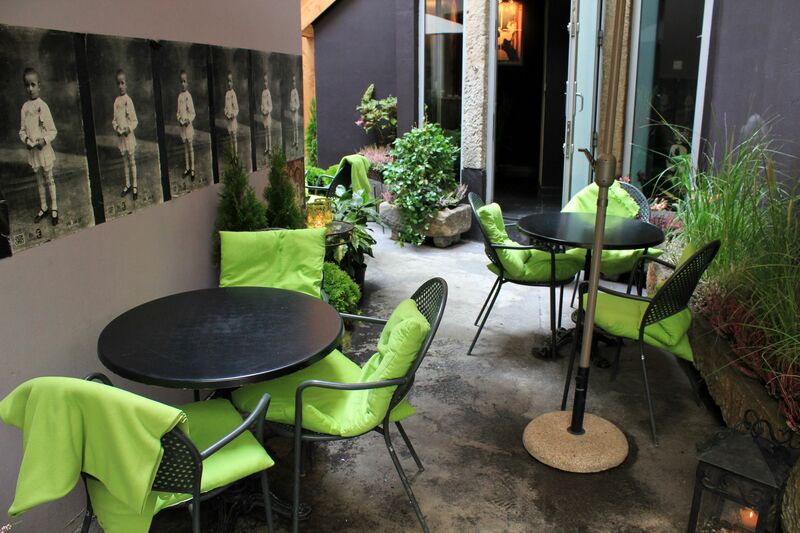 The second one isolated in the courtyard at the back of the Café Camelot is a perfect place to enjoy your journey to the past. It is effectively sealed from the hectic life of the modern city yet still so close to the Krakow’s Main Market Square (just in case you need it). 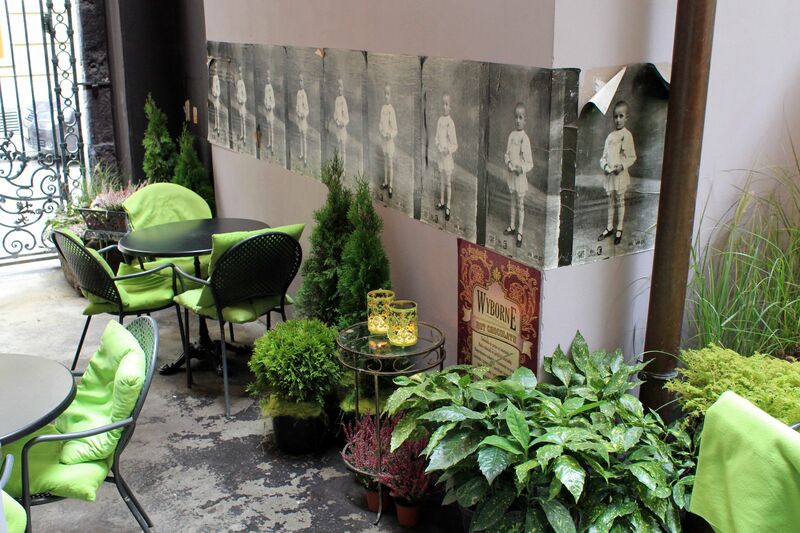 Occasionally, this garden holds an open-air movie shows. 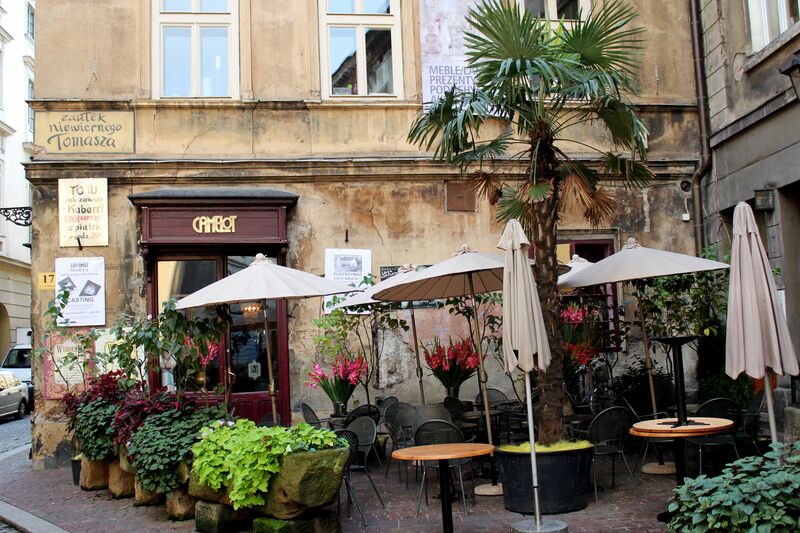 Café-Camelot is so popular with Cracowians and ex-pats that quite often all seats are taken (for hours!). No wonder that Camelot’s Summer Gardens extended their operating time from early spring to late fall (you can rug-up yourself in one of lime-green blankets thoughtfully provided by the café). Café Camelot: Polish version of donuts - "paczki"
If by chance you are in Cracow in early spring time then you will have occasion to be part of the Fat Thursday (“Tłusty czwartek “) feast. The feast observed in last Thursday before Lent is closing the carnival season (similar origins as the Mardi Gras). Traditionally, this day is dedicated to eating, mostly sweets (originally to compensate for the long period of fasting lasting till Easter). 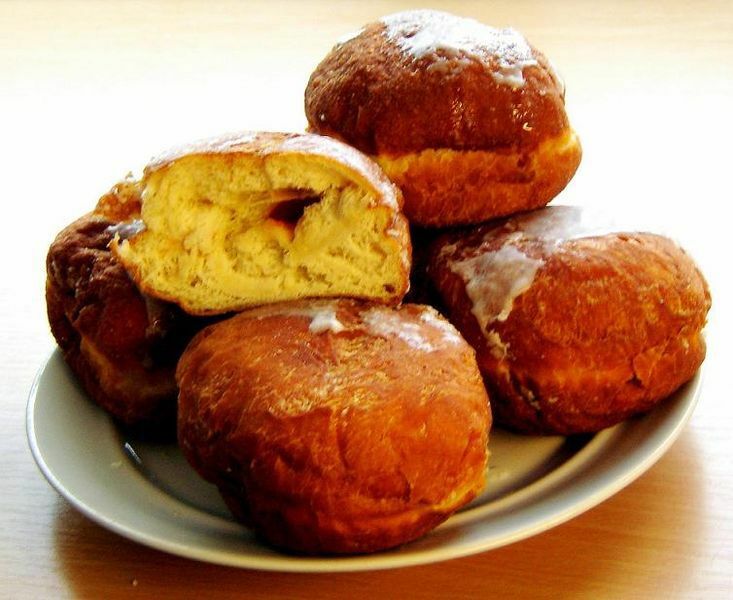 Well, these days the origins of the Fat Thursday are probably largely forgotten, but fortunately the whole idea still holds very well in the collective consciousness of the Polish society. To keep it short – thanks to this tradition you will have opportunity to try “Paczki” (deep-fried, sphere-shaped pastry filled with plums’ marmalade and covered with powdered sugar or icing). I’m mentioning the Fat Thursday Feast because Café Camelot is known for serving that day some of the best paczki in Cracow! Do not take my word for it, just try! (sorry - about 200 calories apiece). 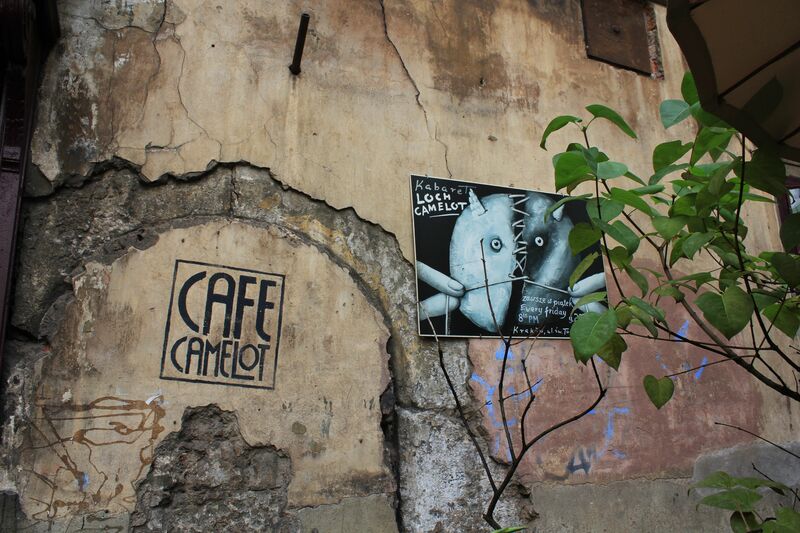 But Café-Camelot is much more than just a hang-out place. It deeply draws from its inherited “rebellious” past and rich history. 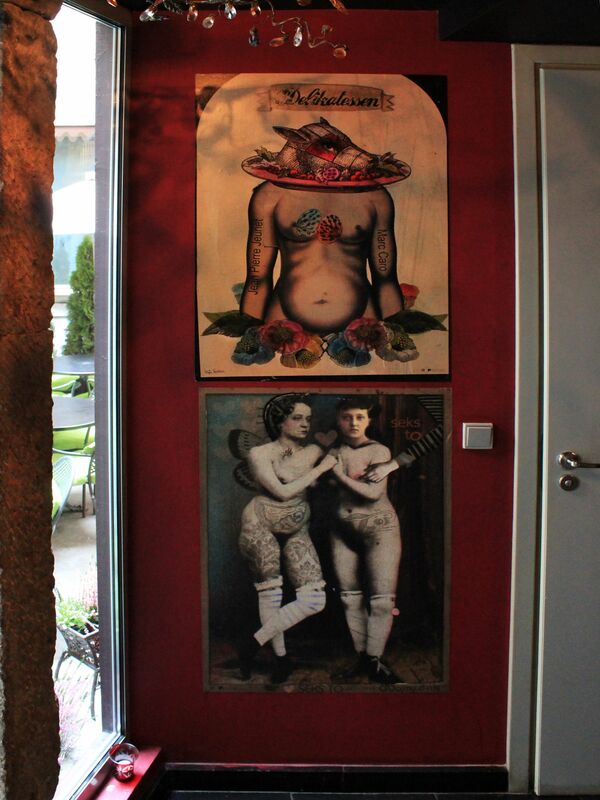 An upstairs gallery presents various photographic exhibits and provides ground for artistic happenings. 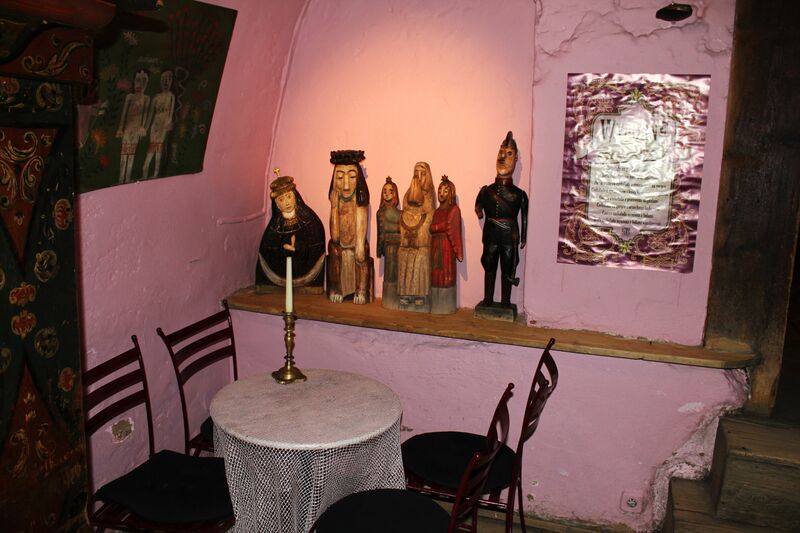 Going downstairs - café’s 14th century cellars are home to the small theater-cabaret Loch Camelot where concerts, recitals, poetry readings and live music are part of the evening’s life. BTW – it was a group of “bohemian artists” gathering in the underground world of Loch Camelot that coined the name “Unfaithful Thomas Lane” probably in contrast to the otherwise “pious” surroundings - the nearby church and the patron of the street (St. Thomas). But in a way – this name perfectly reflects the spiritually cosmopolitan and somehow decadent nature of the Café Camelot and in general that of the recessed corner of the St. Thomas Street …..
You can serve yourself an apple! During the winter warmness spreads from the wood burning stove in the corner…. 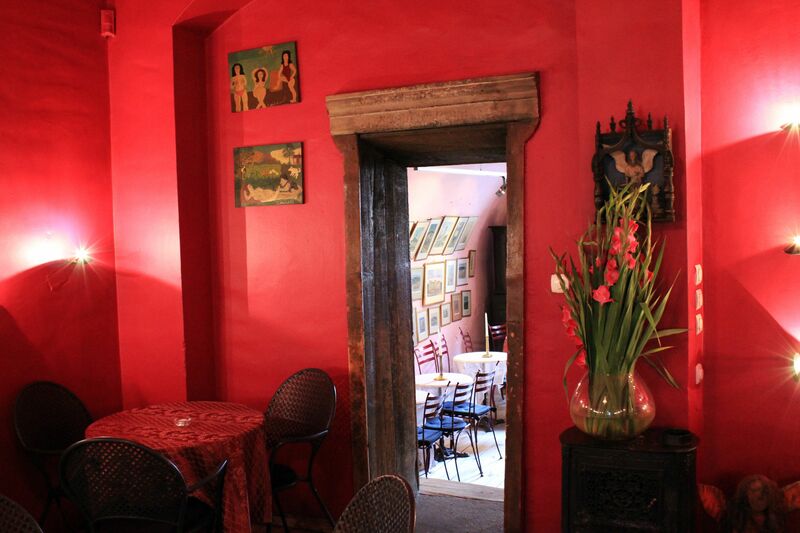 Café Camelot: Red room leads to the outside courtyard with the summer garden. 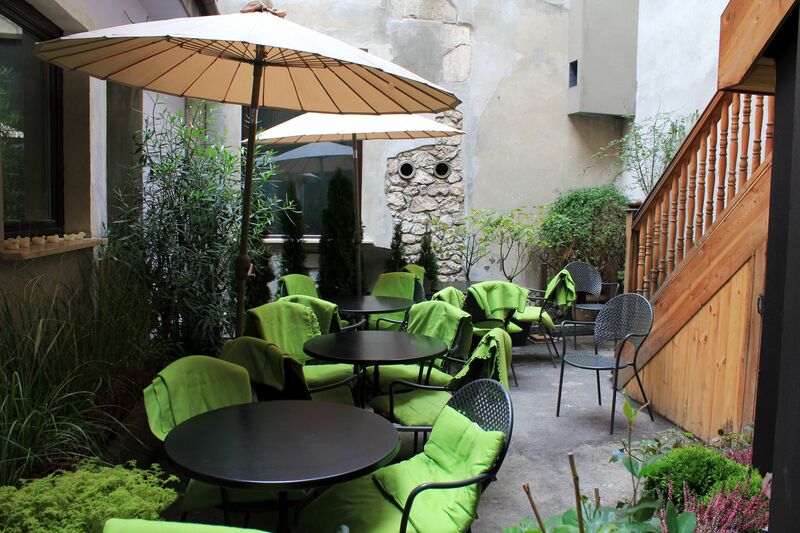 The front and backyard gardens offer the best of both worlds - lazy ambiance of the Cafe-Camelot and the touch of the busy streets of the Krakow's Old Town. 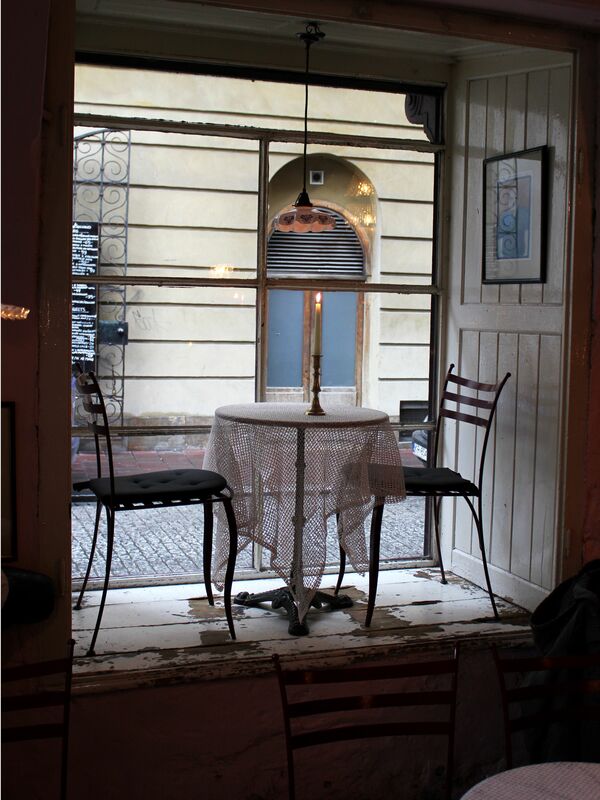 The small table perched in the recessed window is a fabulous place for two… It is a dream place for a romantic “tête-à-tête” with your loved one. 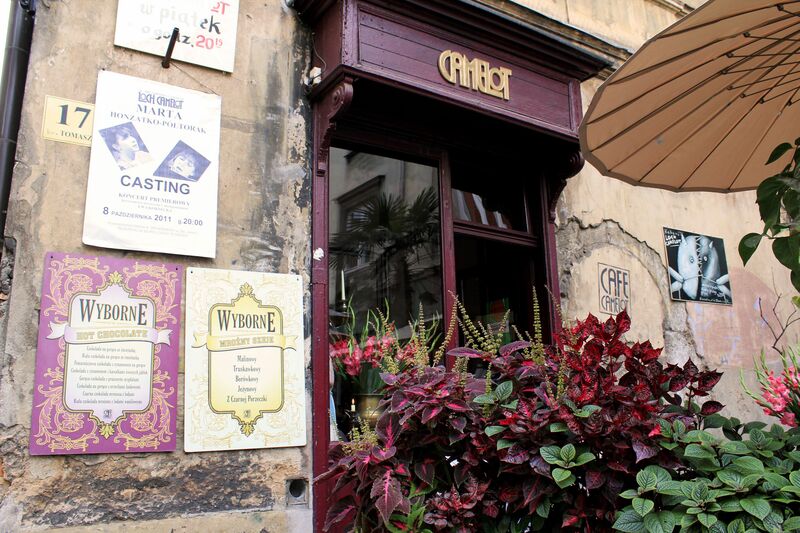 Apparently the Café Camelot is considered as the 3rd best in Cracow after the legendary Jama Michalika on the Florianska Street (in the past – a favorite place of poets and artists) and Nowa Prowincja (on the Bracka Street). 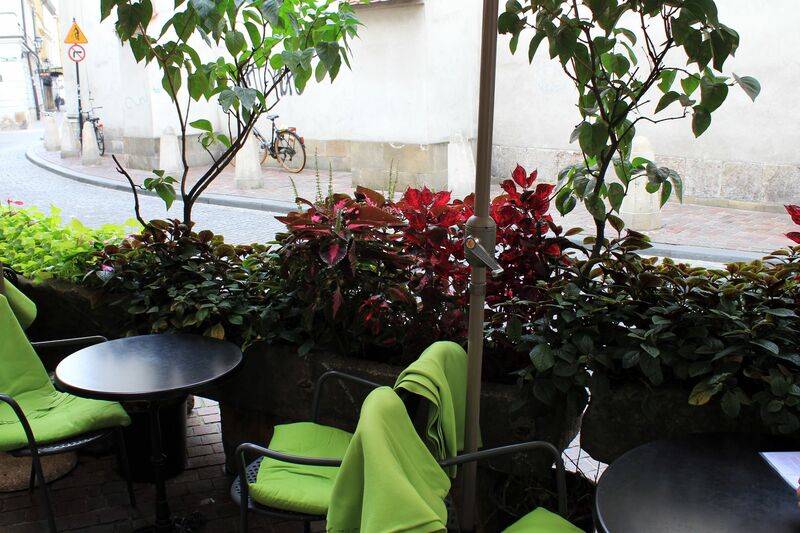 But the widespread rumor has it that Café Camelot is the only place in Cracow that can’t be any better…..and it tells you all! On the downside – it may happen that the staff will be testing your patience not noticing you for a while…. My advice – take it easy, Café Camelot is not a fast-food bar, you are not here to “grab-and-run” (if this was your plan then you are definitely in the wrong place).